Rory McIlroy and NBC Sports have announced a partnership on GOLFPASS, a $9.99/mo subscription service designed for people who both play and watch golf. A twist on the sort of over-the-top streaming options that are still popping up (and separate from NBC Sports Gold, the new home for PGA Tour Live), GOLFPASS instead combines golf instruction, golf travel deals and exclusives, hours of historic golf footage in the NBC library, and McIlroy himself as a sort of lifestyle/content hybrid. It’s almost more in line with a monthly men’s fashion subscription box than it is with ESPN+ or Sports Gold. It’s Rory’s star power that’s driving the whole thing, which is an interesting move for both parties. No professional golfer has come close to matching Tiger Woods for star power, but Rory McIlroy is certainly in the next tier, and at 29 he’ll obviously be around for a while, and clearly he’s at all-in, at least at the start, as NBC ran him through their own version of a carwash. Rory appeared on Fallon, TODAY, and is guesting on a host of other NBC/Golf Channel properties as well, along with a few outside the NBC umbrella. I think golf is uniquely placed and it’s a unique game where the people that watch golf on TV are the ones that play the game, as well, you know, and I think you can’t say that for a lot of sports. I think that’s why GolfPass is so good; you make the game more accessible for people, just make it easier to play. Obviously guys are — people are going to go on there and watch content, but you can learn about your game, you can try and improve your golf, you can play more golf. I think it’s a really — it’s taking The Golf Channel that was founded 25 years ago by Arnold [Palmer] and bringing it into the 21st century, and I think Arnold would be very proud of what we’re trying to do here today. I’m excited to partner with NBC and The Golf Channel. I don’t think any other business or any other organization in golf do more to grow the game than The Golf Channel; as Mike said, 500 million homes, 70 different countries. They’ve broadcast the game on a global stage, and that’s why I’m so excited to partner with them. So, is GOLFPASS worth it? If you don’t play golf, no, probably not, but a lot of people play golf, and thanks to a lot of somewhat problematic economic factors, people who play golf are also the people who are most likely to have interest in and money for a subscription service. The main draw, on the surface, is the access to a free round of golf through GolfNow and the digital content, which includes an interview series with McIlroy and watching Rory (and then other athletes) detail their daily routines. However, it’s also perhaps somewhat problematic that NBC and Golf Channel are going so directly into business with an athlete they cover on a nearly-weekly basis. Golf coverage already sometimes struggles with deciding which players to show and how much to show them, and if we start to get lingering shots of Rory walking up the fairway while GOLFPASS is being promoted on-screen, it’s not going to go over well. That’s something to keep an eye on. 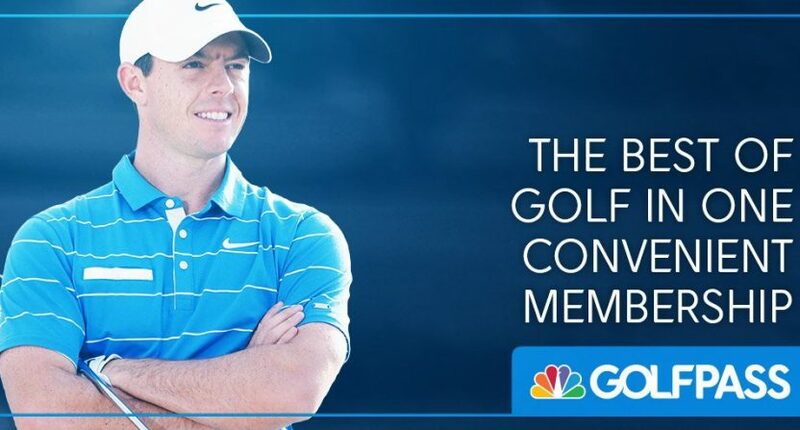 Whether McIlroy’s name is enough to prove this concept remains to be seen, but for NBC, attempting to leverage some disparate golf assets under one umbrella seems worth a try. We’ll see how this does.